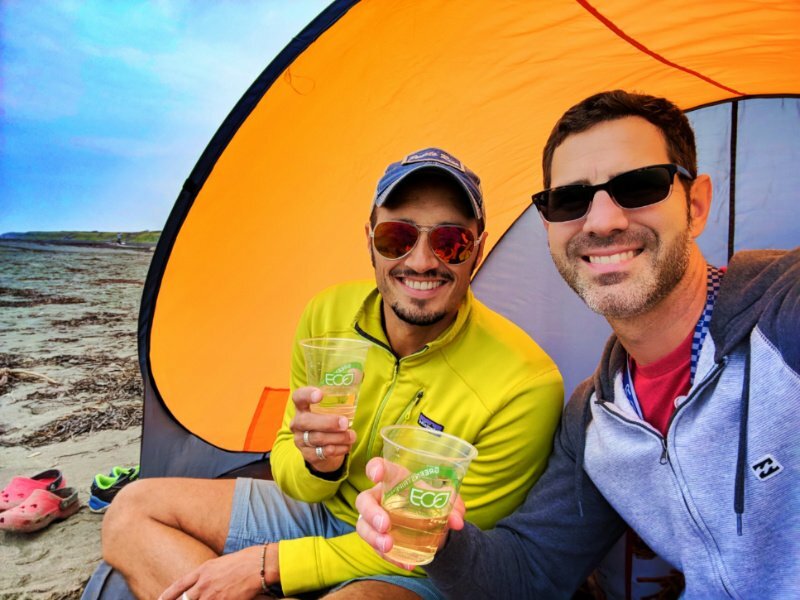 Note: you can also do the auto ferry from Anacortes, WA but it takes a bit longer since it goes through the San Juan Islands and makes several stops along the way. 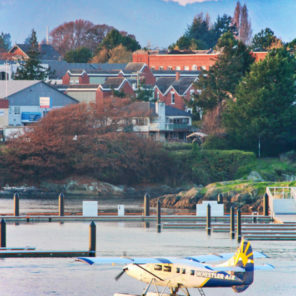 You can also fly to Victoria from both Seattle and Vancouver via seaplane or regular aircraft. 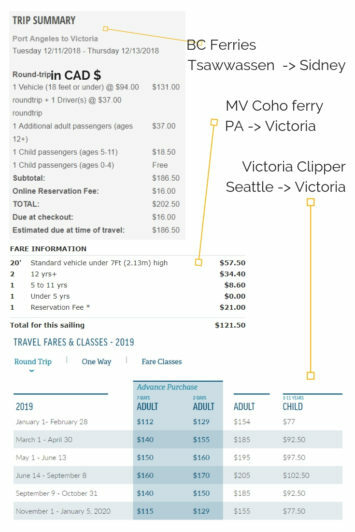 This is for sure not the budget option for a family to get to Vancouver Island, particularly if you want also have a car on the island, but it’s an option. Flying in via Seaplane is really cool. Remember, Victoria is in Canada so a passport is required. DO NOT FORGET PASSPORTS. 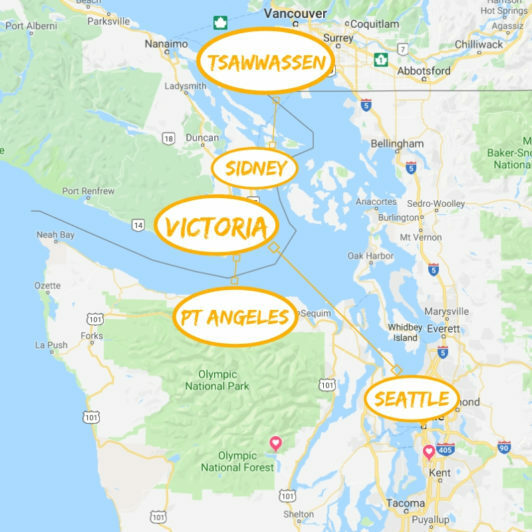 Since we aren’t digging into all of the hiking and kayaking destinations around Victoria, we’re going to keep our top activities in Victoria with kids to things in Victoria proper, Saanich, Brentwood Bay and Sidney. 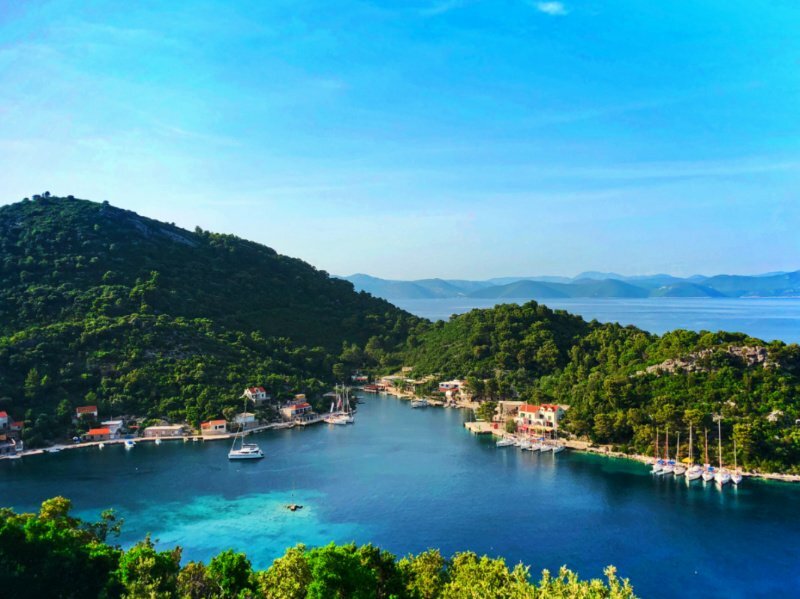 Since this part of the island is rather condensed, getting between each spot is fairly easy by bus, super easy by car, and totally doable (with time) by bicycle if weather is permitting. Note: please confirm hours of operation with each activity before adding to your plan. We’ve included posted hours, but they are subject to change without notice or in conjunction with events. 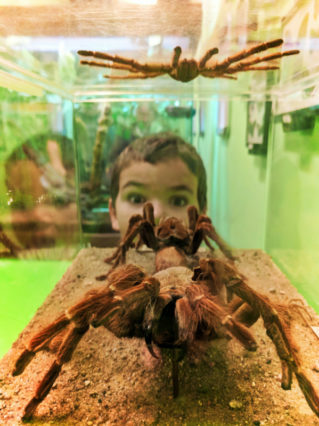 I’m starting here because if you need to keep one thing in mind to leverage when you do Victoria with kids, it’s the Victoria Bug Zoo. 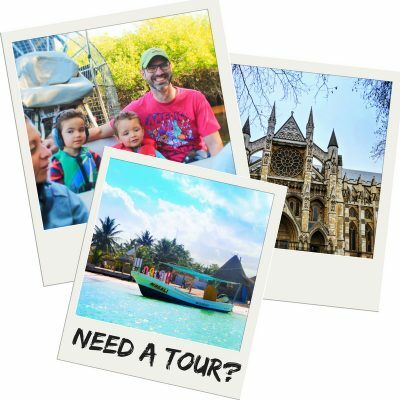 I know, this is not what you’d expect at the top of a list for such a beautiful, amazing city, but it’s a winner with kids (and adults). 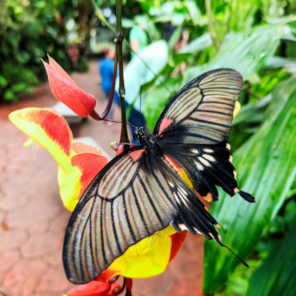 The Bug Zoo has a very impressive collection of tarantulas, stick bugs, exotic insects and butterfly specimens. 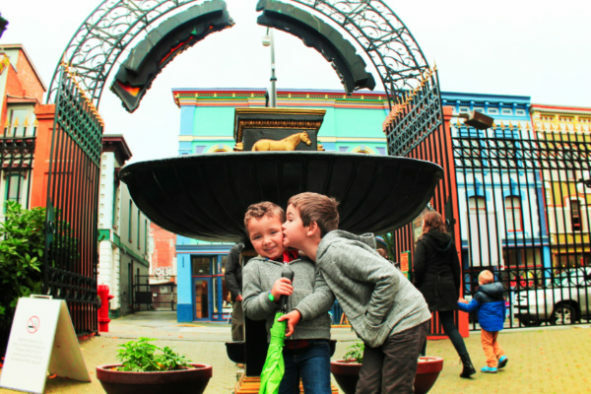 This was an awesome stop for us and made Victoria with kids an easy addition to our world-schooling plans. 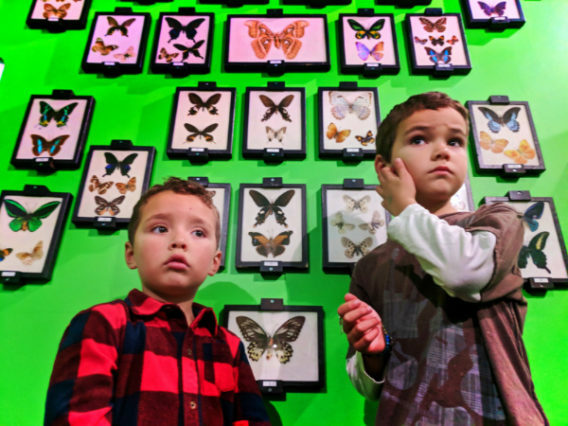 Tip: take part in the “tour” and actually hold the bugs. So cool. Location: near the Fairmont Empress Google Maps link here. 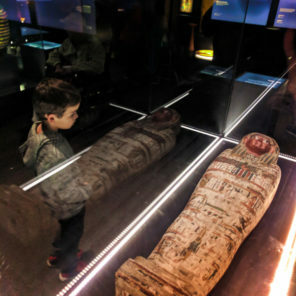 We’re very selective about which museums we take our boys to. We want to be sure they’re interesting, educational, and that they’ll genuinely feel a connection to something there. The Royal BC Museum checked all those boxes. 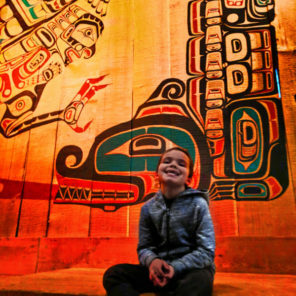 We went for the totem poles and incredible First Nations exhibits, and left excited about Egyptology and prehistoric creatures. As adults we could’ve stayed for at least three hours, but with two kids we only explored the Royal BC Museum for just under two hours. Tip: in the First Nations area, take time to explain to kids about western expansion and the obliteration of native tribes. It’ll make the whole exhibit must more understandable. coat check – seriously, this is exceptionally important when you’re spending an hour in an 80 degree humid space. Location: near the Butchart Gardens, Brentwood Bay area Google Maps link here. Can you really explain the cool buildings and Victorian era lifestyle to kids without including a little history? Or a castle? You could, but why would you want to? 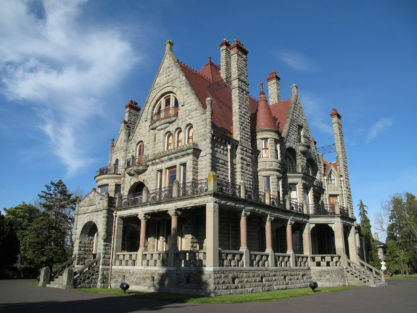 Craigdarroch Castle is a nice walk or short ride just outside of the downtown area. 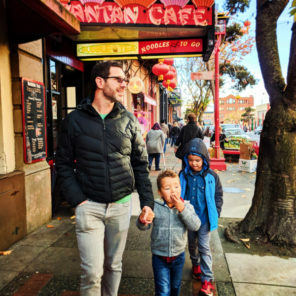 Victoria with kids is very doable on foot, including walking to the Castle, so plan to visit on a nicer day and enjoy the neighborhood along the way. Once there, do a guided tour (not too long) of the really impressive rooms and grounds. Watch for ghosts, ask questions of the docents, and take lots of cool pictures! 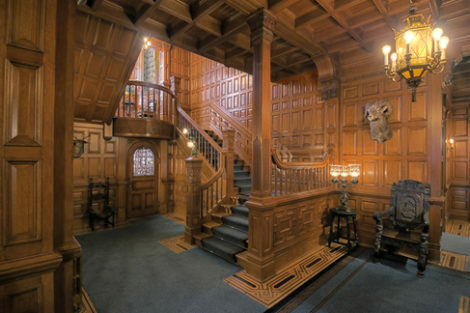 Note: if you live on Vancouver Island and have a Greater Victoria Public Library card, you can use the ePass system for free admission to Craigdarroch Castle. Location: east of downtown, Rockland neighborhood Google Maps link here. Our kids’ favorite thing in any museum are always the dioramas; you know, the scenes that are setup like a snapshot in time of a town full of people or an event. 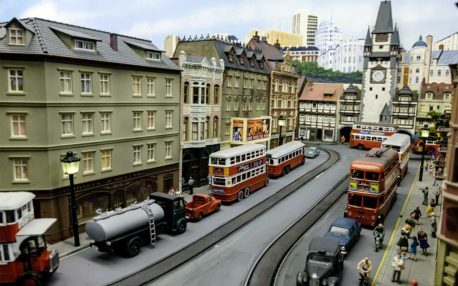 Miniature World is nothing but dioramas and they are impressive! 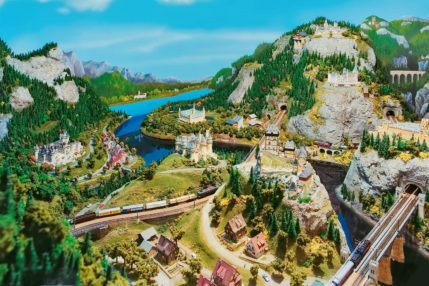 From castles and villages to space exploration, Miniature World is full of the most impressively intricate models. 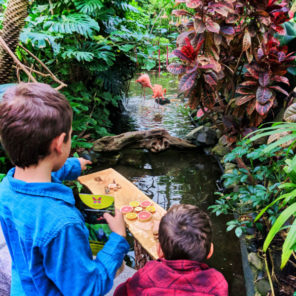 If only the kids could play with them unsupervised… Tip: this is a great activity to add to a Victoria Bug Zoo visit, as it’s very close and will keeps the momentum of fun going. 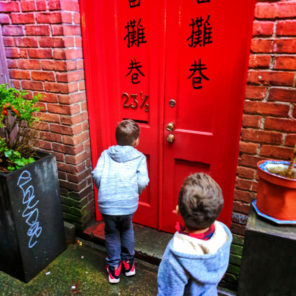 When doing Victoria with kids, you HAVE TO VISIT CHINATOWN. It’s such an easy walk from the downtown area that you don’t even realize you’re nearly there almost all the time. 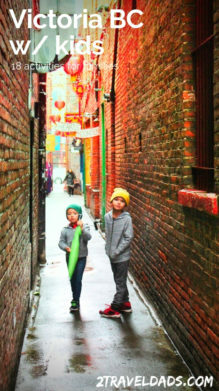 We actually spend a lot of time in Chinatown during each visit to Victoria due to the great restaurants (Chinese and not), the interesting stores (for more than standard Chinatown souvenirs) and the great photo ops. The red Chinese lanterns are always hung and the vibe is always buzzing. 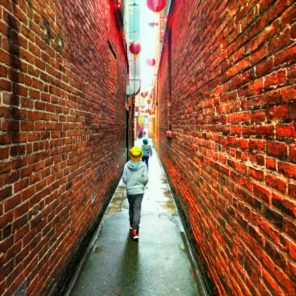 Must see: Fan Tan Alley is the narrowest street in North America. 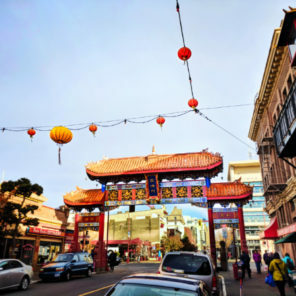 There are many businesses off the alley and if you’re there early or late enough, it feel like you’ve stepped back in time to 1800s Chinatown. Location: just north of downtown Google Maps link here. Location: first stop is the Empress Dock, map link has all stops to catch boat Google Maps link here. 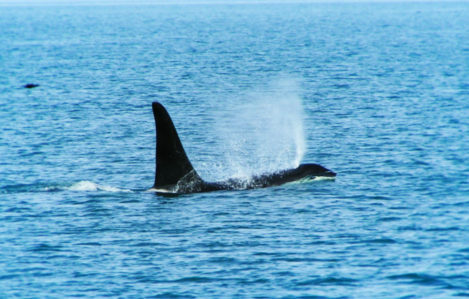 Depending on the season and what you want to sea, you’ll have several great options for wildlife and whale watching out of Victoria. 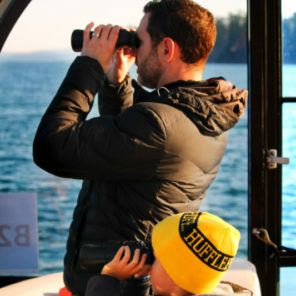 You could do the crazy open speed boat out into the Strait of Juan de Fuca leaving from the Inner Harbour, or you could do a more tame, longer tour (kid friendly whale watching). 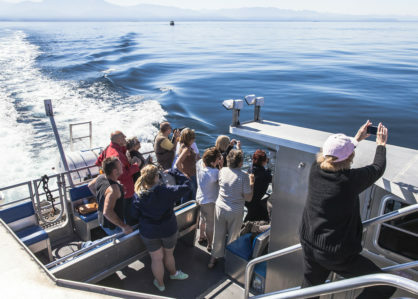 We’ve done these and enjoyed them, but really fell in love with the Salish Sea when doing an ecotour out of Sidney, BC. 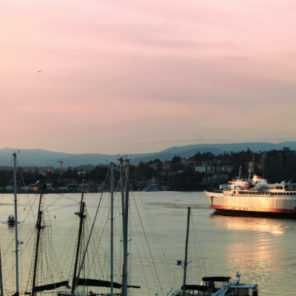 Ecocruising is a small operator running out of Brentwood Bay and Sidney, both about a half hour from downtown Victoria. 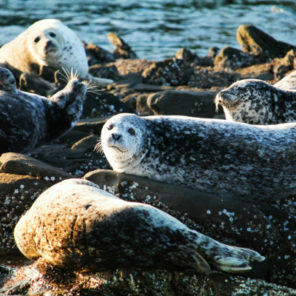 Meandering through small islands and rookeries, Ecocruising provides up close, respectful wildlife viewing ranging from orcas and porpoises to harbor seals and bald eagles. 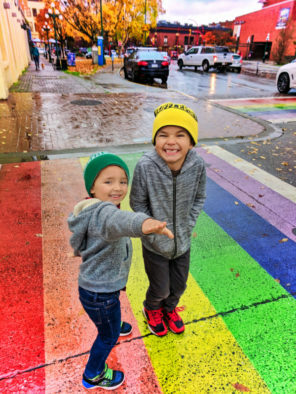 This was the highlight of our most recent trip to Victoria with kids. 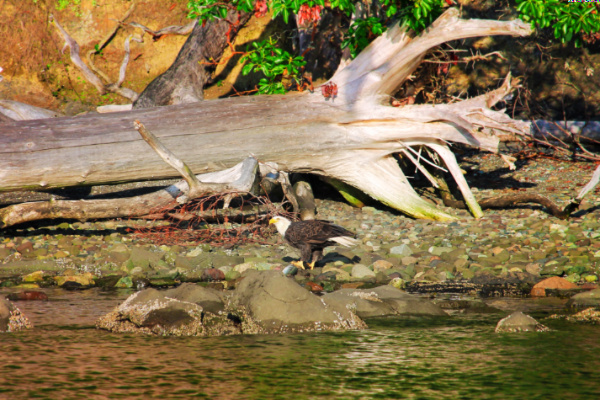 We love ecotourism and this company is passionate about sharing and protecting the environment of the Salish Sea. Victoria Location: Inner Harbour near tourist office Google Maps link here. Sidney Location: Canoe Cove Marina Google Maps link here. 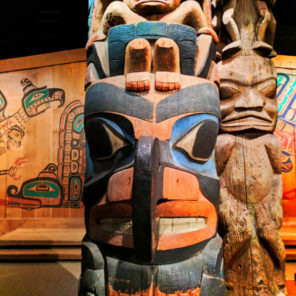 Part of the Royal BC Museum, this collection of totem poles and a replica longhouse is worth visiting. You can pair a visit to Thunderbid Park with your trip to the museum or work it in wherever you have the time. 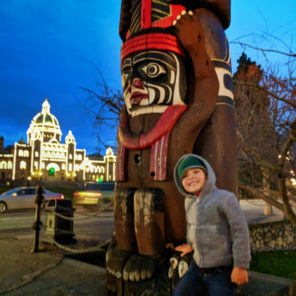 The totem poles are best viewed/photographed early in the day when the sun is on them, but if you’re doing Victoria with kids, you’re probably not going to be up super early and out and about. Location: between Royal BC Museum and Beacon Hill Park Google Maps link here. 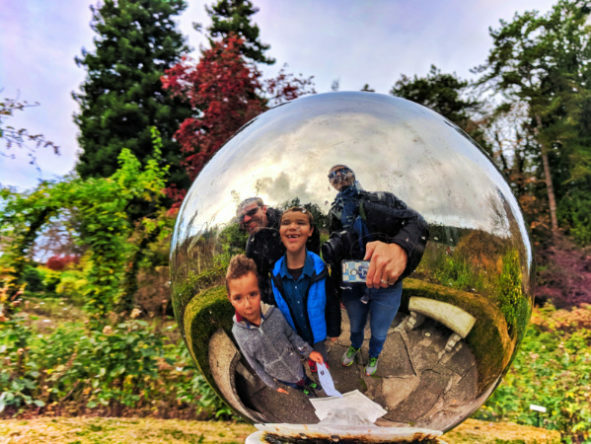 We have been to the Butchart Gardens four or five times and still love it. An ideal representation of Victorian gardens, it’s much more kid-friendly than you might expect. 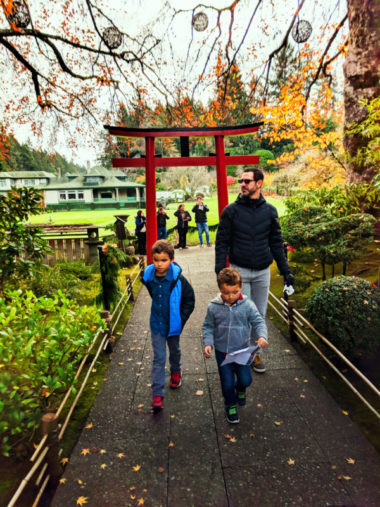 True, you can’t let the kids run free and pick flowers, but they’ll enjoy the Butchart Gardens just the same. There are fountains, sculptures, a Japanese garden, totem poles, and in the winter there’s even an ice rink. Tip: be sure to pick up a scavenger hunt sheet from the visitors desk to give the kids a little something extra to keep them interested. 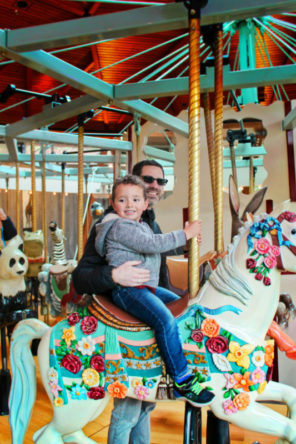 And for those who love getting dizzy, the carousel at the Butchart Gardens is one of the most beautiful ones we’ve seen. 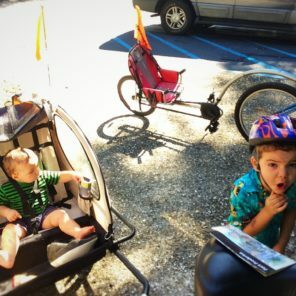 The cost to ride is an extra $2 per person (parents ride free for safety). Location: north of Victoria in Brentwood Bay Google Maps link here. 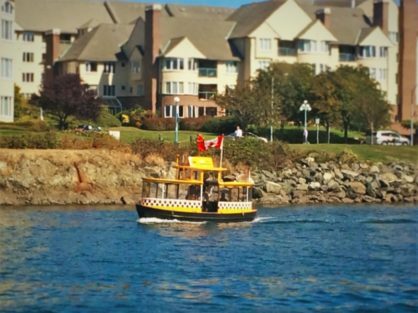 Since we recommend getting a taste of what’s just beyond downtown Victoria, a day trip to Sidney is a great idea. The Shaw Centre for the Salish Sea is a small aquarium located just off the marina in quint little Sidney. 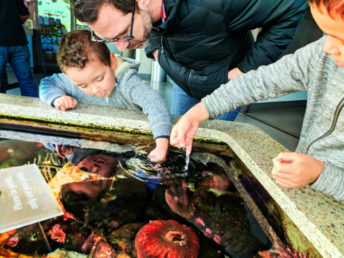 The Centre has touch tanks and exhibits showcasing the native marine life (except for mammals) of the surrounding bodies of water. 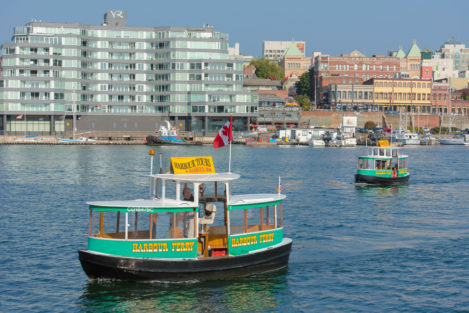 With lots of hands-on activities, it’s a great morning activity in Sidney before walking around the waterfront and downtown. Location: Sidney marina area Google Maps link here. 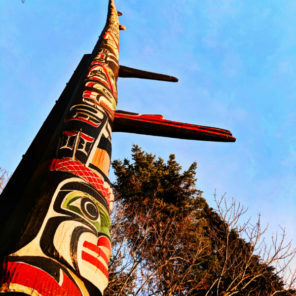 One of the things we love about living in the Pacific Northwest are all of the totem poles and native art everywhere. 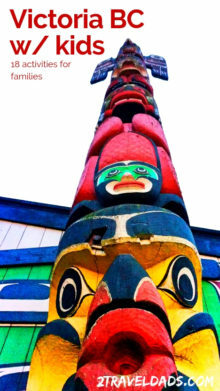 Victoria with kids is one big ongoing scavenger hunt to find totem poles! They are all over the place, but there are many that you have to know where to look. 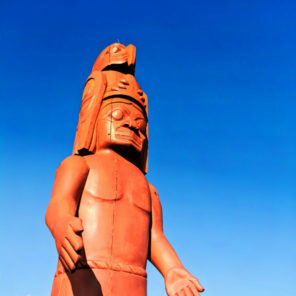 We’ve created a map to guide you around Victoria and beyond to find a wide variety of totem poles. 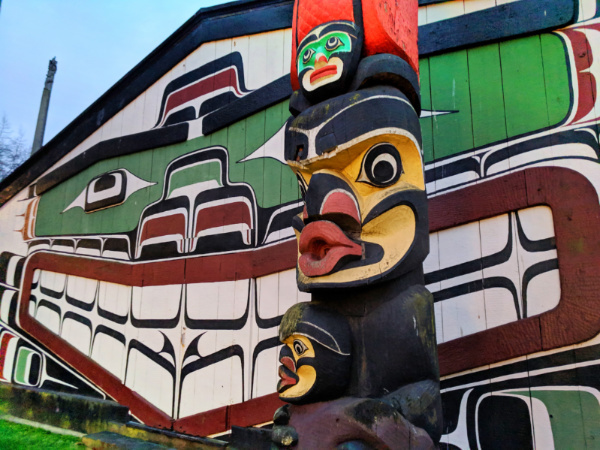 Tip: If you’re looking to book a great hotel that’s full of art, the Inn at Laurel Point has a very impressive collection of First Nations art and artifacts, but it’s for guests to enjoy while staying there only. Location: all around Victoria’s downtown and beyond Google Maps link here. 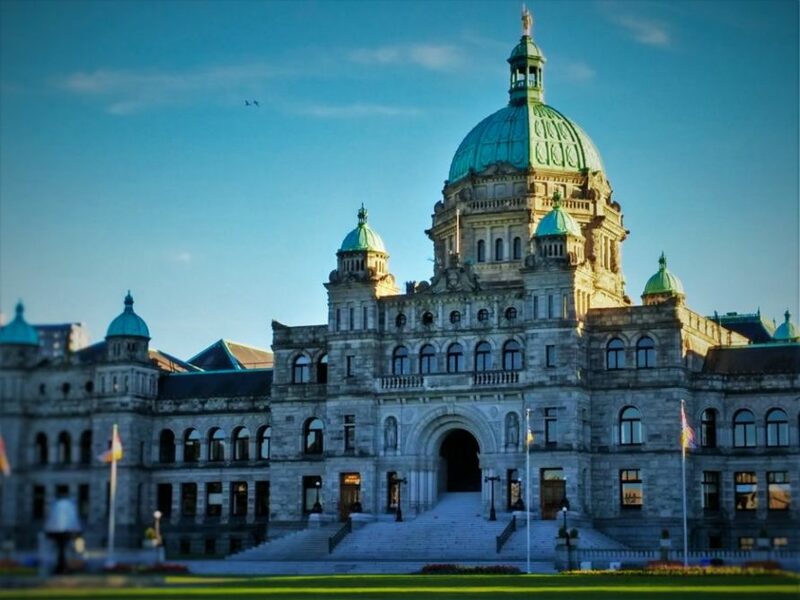 We’re always fascinated by grand buildings and the parliament building in Victoria is no exception. 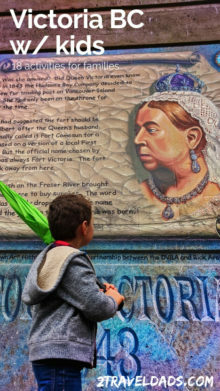 You can actually add a tour of parliament to your Victoria with kids itinerary very easily, as they run tours daily. You can do short “express” tours of about 20 minutes or you can do the full architecture tour which lasts 90 minutes. Photography may be limited and tour schedules may be changed depending on when parliament is in session, but it should’ve be too difficult to get onto a tour during one of your days in Victoria. 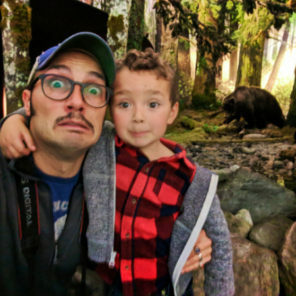 Tip: if you have small kids, the express tour is recommended as the building is a functioning government space and longer tours may make for antsy children. This sounds odd, but the city of Victoria is full of small and large courtyards surrounded by shops and cafes. You’ll find the Public Market, Market Square, Bastion Square are all very easy to get to and each is full of good food and interesting shops and galleries. Perfect to add to a day in Victoria with kids. Our favorite is Market Square. 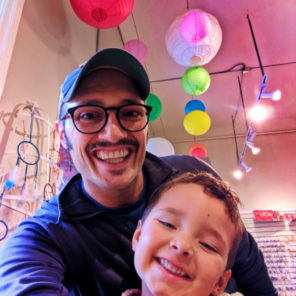 On our most recent trip to Victoria we spent a morning at Beadworld in Market Square working with some veteran bead artisans, making souvenir bracelets. It was the perfect morning for a craft project and a great way to bring home a zero-waste souvenir. And then we got coffee and hot chocolate right after, so that was a win too. 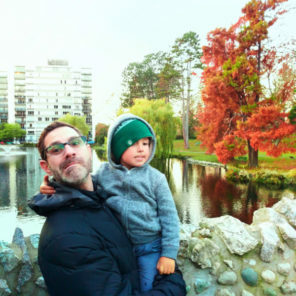 Beacon Hill Park in Victoria has long been our favorite city park in North America. Spending an afternoon at Beacon Hill Park is a must for doing Victoria with kids. 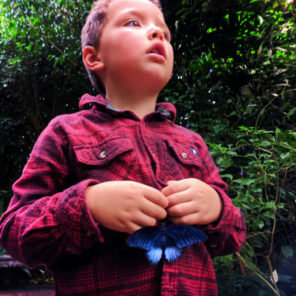 Between the peacocks running around, the Children’s Farm, the playgrounds, walking trails, views from the bluff, the tallest free-standing totem pole in the world, and ornate Victorian gardens, it’s an incredible place. 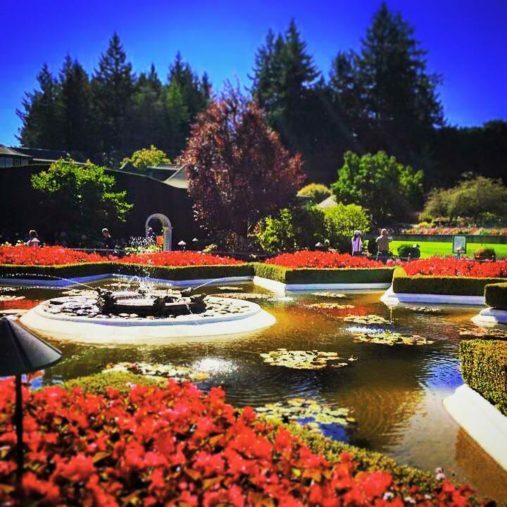 Confession: it’s cooler than Seattle’s Volunteer Park or SF’s Golden Gate Park (IMHO). 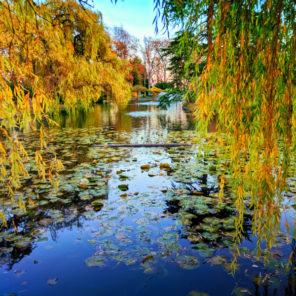 Tip: another great park is Irving Park. You’ll find peacocks there too, as well as a labrynth. Location: south of downtown to the bluffs Google Maps link here. 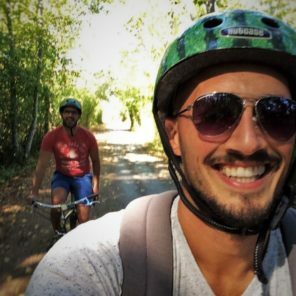 Biking the Galloping Goose Trail out of Victoria is so much fun and great exercise! 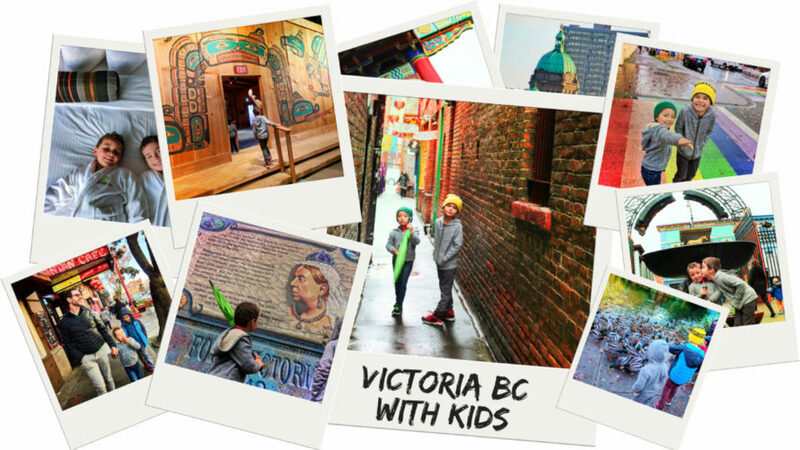 This is a great summer activity for Victoria with kids, especially if you have older children. 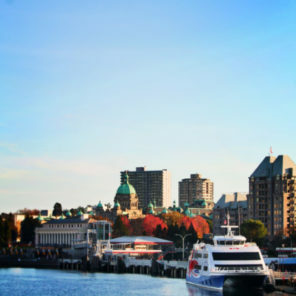 Starting downtown or anywhere really, you head north out of the main core of Victoria to connect to the Galloping Goose trail, which will take you up to the Butchart Gardens and Brentwood Bay. 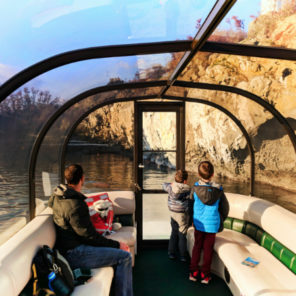 It’s a great way to experience the southern end of Vancouver Island. 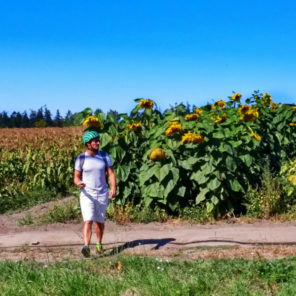 Heading east into the farming valleys of Saanichton and then south along the Lochside Trail, you’ll ride through neighborhoods, sunflower fields, marshes and more. It’s incredible. Location: Biking Route via Google Maps link here. 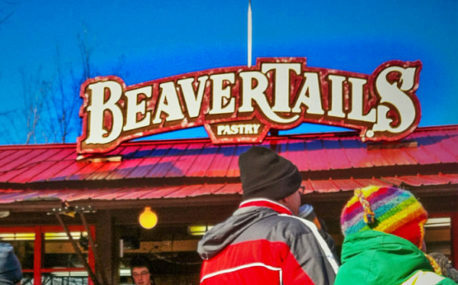 A Canadian delicacy, beaver tails are the great northern equivalent of an elephant ear. Usually dusted with cinnamon and sugar or topped with maple and whipped cream, or Nutella or apples or everything. 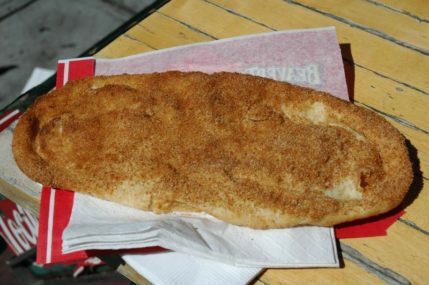 One BeaverTail will suffice to share, but you know, when in Rome… There is a BeaverTail stand directly downtown, across from the Bug Zoo and then during festivals, like the street hockey festival in February or summer concerts. Tip: napkins and wet wipes. Location: downtown and at festivals Google Maps link here. I’ll confess, we haven’t done this with the kids yet, but we’ve done it as adults. It’s fun and delicious. 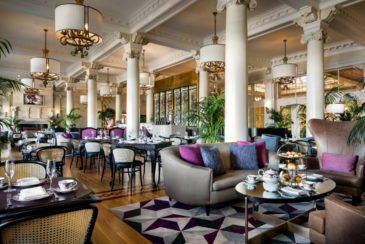 Afternoon tea in Victoria can be as costly or as budget-friendly as you want it to be. 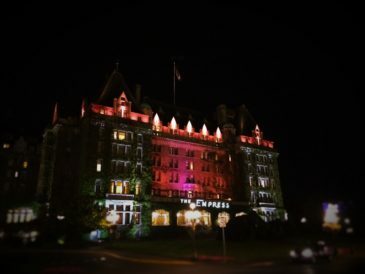 There are several shops and restaurants that will do a tea service but our two recommendation are the Empress Hotel (high end) or Murchie’s (budget). 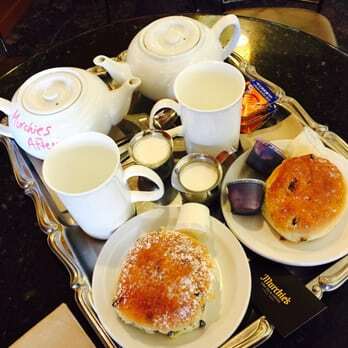 The Empress’ tea service is very comprehensive with trays of finger sandwiches, scones and deserts, including tea. Tip: the Empress does a children’s tea service also. It’s very nice and quite the touristy thing to do. 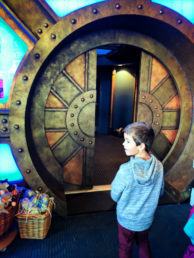 Murchie’s is much more relaxed and a better option for doing tea in Victoria with kids. Either doing a pre-set menu or going a la carte, you can do Murchie’s without reservations and you can linger as long as you like. This is our favorite place for tea. Tip: leave with a box of Orange Pekoe tea; it’s my favorite! Location: Fairmont Empress Google Maps link here. Murchie’s Tea downtown Google Maps link here. NOTE: if you’re booking Tea at the Empress, know that there is a strict dress code and reservations require a credit card. Failure to show up will result in a 50% charge for the reserved tea services. be zero-waste and avoid cheap toys and items made of plastic wrapped in plastic. 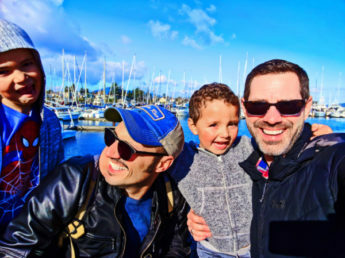 Keeping these points in mind you’ll for sure be able to find a thoughtful, memorable souvenir that you and your kids will enjoy long after your trip to Victoria is over. Wow! 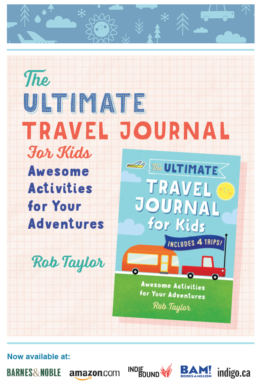 I know that was a lot of information, but aren’t you excited to plan a trip to Victoria with kids?! We’re so ready to go back and hopefully will do so in late spring, as that’s our favorite time to visit. 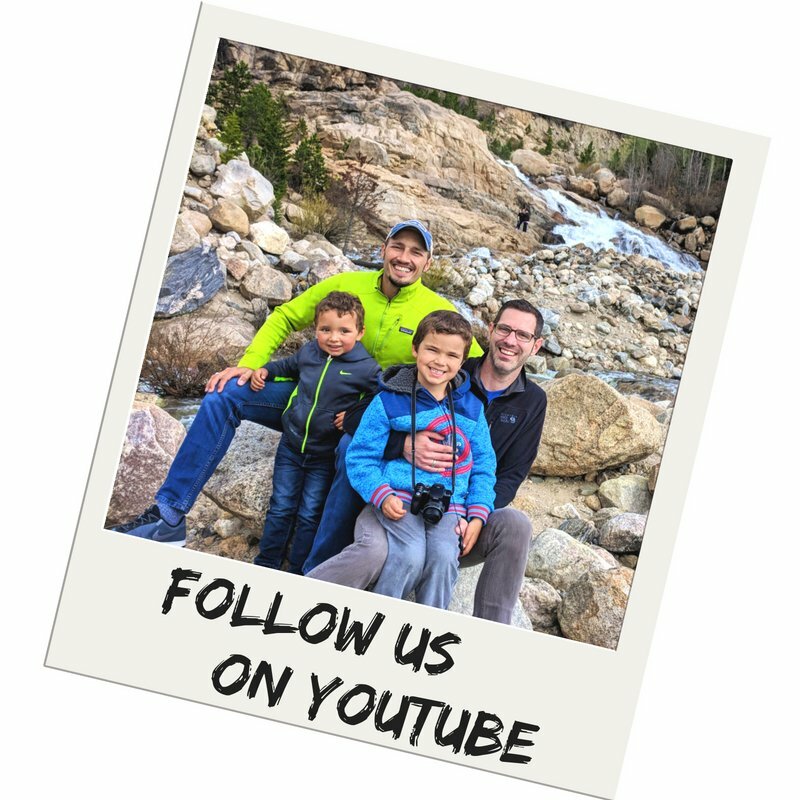 Please let us know if you have any questions or need any help planning your trip! 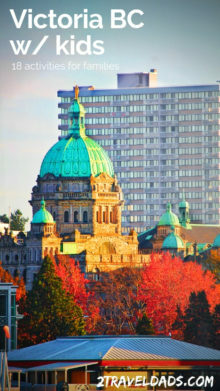 Also check out our 3 Day Victoria Itinerary for couples and our Family Travel Journal for more ideas. 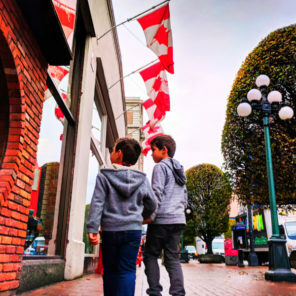 Want to pin this article for planning your own trip to Victoria with kids? Go for it!! !